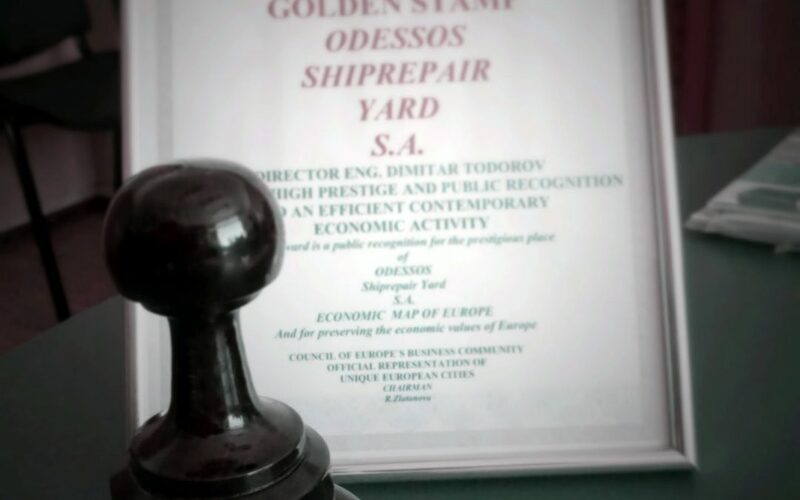 Golden Stamp Award | Odessos Shiprepair Yard S.A.
Council of Europe’s scientific and cultural community awards Odessos Shiprepair Yard with Golden Stamp for contribution to the prestige of European Innovative Management. Our Executive Director Eng. Dimitar Todorov possesses high prestige and public recognition and an efficient contemporary economic activity. This award is a public recognition for the prestigious place of Odessos Shiprepair Yard S.A. and for preserving the economic values of Europe. We are thankful for the award!